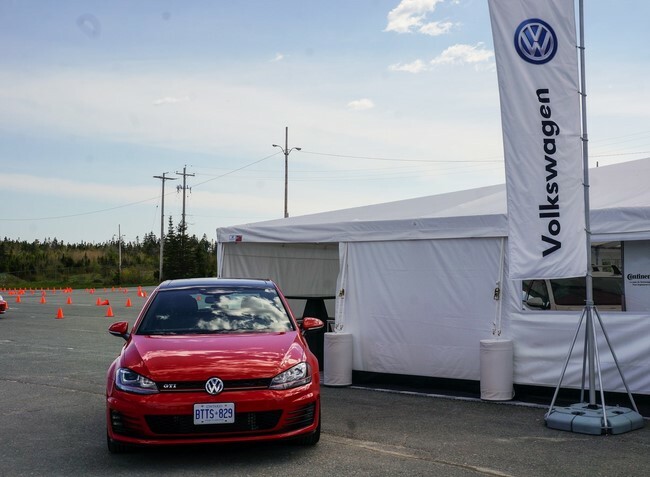 This weekend I was invited to be one of the first Canadians to test drive Volkswagen’s new Golf and Golf GTI 2015 models at the Golf Driving Experience in Halifax (read on to find out how you can take part in the experience too)! 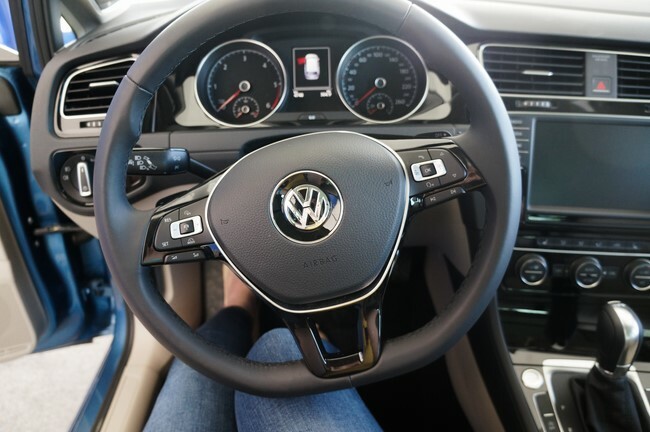 Driving up to the event I had no idea what to expect – boy does VW ever know how to set up! Not only did they have two test drive tracks set up, they had a beautiful lounge with comfy couches, popcorn and awesome displays and presentations showcasing the sleek new models. What a way to celebrate a great new take on the classic Golf line! Ooh, das auto! 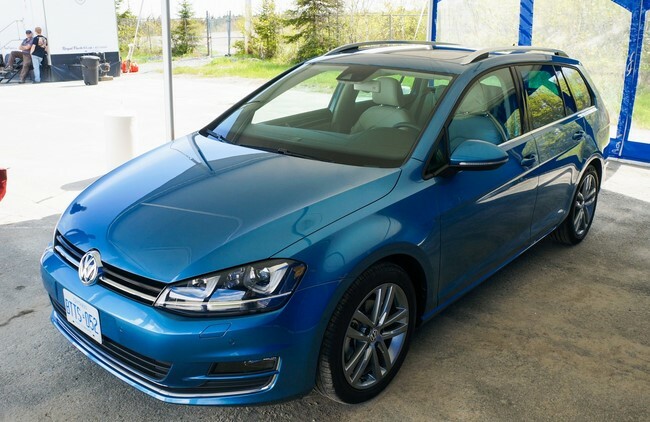 The 2015 Golf comes packed with VW quality and power, as well as a few awesome new features including a variable trunk size, panorama tilt and slide sunroof, and the incredible “Infotainment” system. 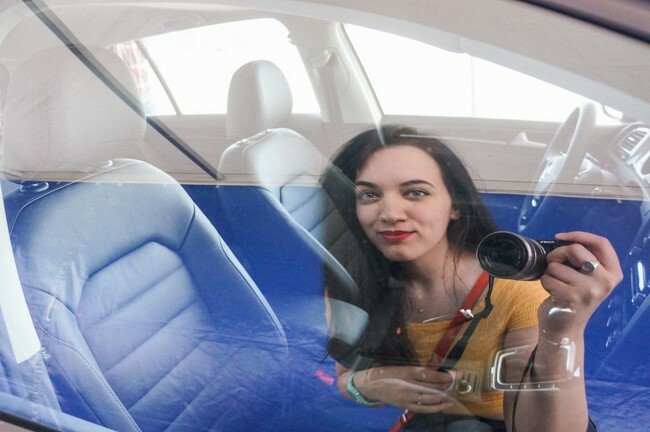 This infotainment system is the feature that caught my eye most – its new proximity sensor lets you interact with the high-res screen without focusing your valuable attention on it (aka squinting to try and read it) while driving because it magnifies the button you’re hovering over for easy legibility. Its new, faster processor promises better results when traveling with the built-in navigation, making for an overall safer and less stressful drive. On the topic of safety, the headlights have been redesigned to be more dynamic and augment nighttime driving more than ever before, adding yet another layer of comfort and ease to the experience. A windshield sensor registers when a car is approaching and automatically dims your highbeams for you – no more angry drivers cussing you out (or dangerous collisions, of course)! The headlights also know when you’re about to turn, and they rotate to face your destination, literally enabling you to see around corners. Pretty nifty, eh? The other feature that really stood out to me was the moveable floor in the trunk – you can lower it to get 9cm more space in the trunk! How’s that for space efficiency? After a walkaround intro to the Golf’s new design, we were paired up with pro Canadian racers to go out on the tracks in both the Golf and the Golf GTI! Both cars are gorgeous and powerful in their own ways; two cars born from the same idea, but distinctly unique in feel and performance. The GTI rips through the track with speed and agility, and one heck of a braking assist system. And the Golf has power too, but it feels like it rides higher and smoother, with a more family-friendly turn and a softer growl. Both cars come equipped with easily-toggled sport mode, adding an extra boost into the drive. With the awesome coaching of the racers, we were able to get the most out of the test drive and really get a good feel of both the Golf and the Golf GTI. I highly recommend this experience to anyone who drives – who wouldn’t love a free opportunity to test a vehicle before it hits the market? 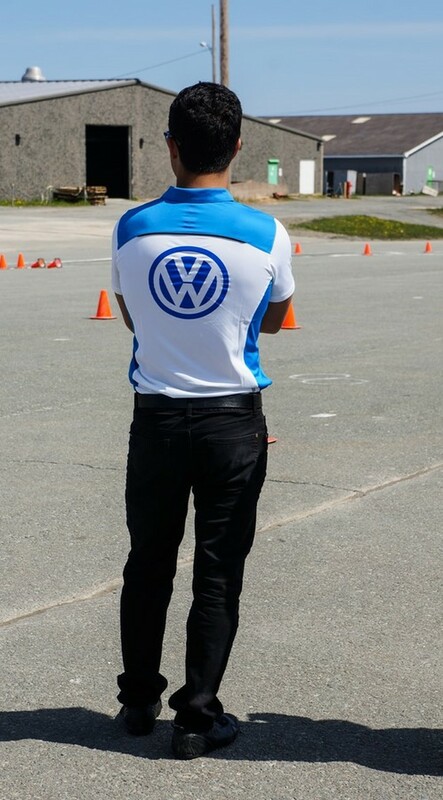 Lucky for us Canadians, the wonderful team at Volkswagen is taking the Golfs on a national coast-to-coast tour this summer, with stops in Montreal, Toronto, Calgary and Vancouver. 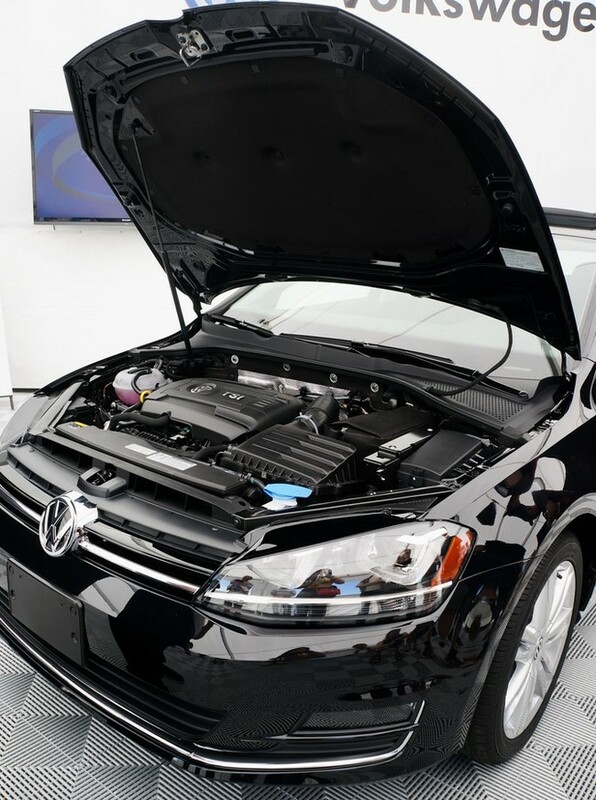 The event is completely free and all you have to do is pick a time slot on the VW website! I had a thoroughly awesome time at this event and I hope some of you take advantage of this awesome opportunity to test the 2015 Golfs out yourselves. 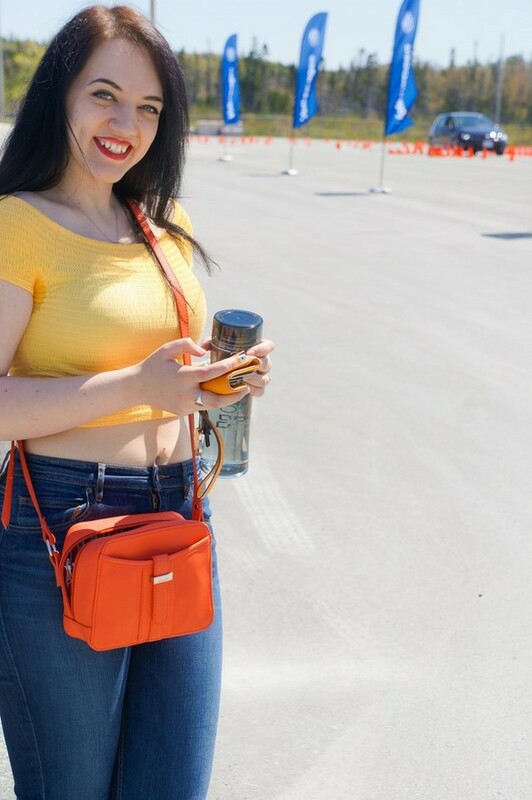 This is one of those rare times when a company is giving without strings attached – no payments, no signing your life away, not even a mandatory mailing list sign up, just a really fun time. 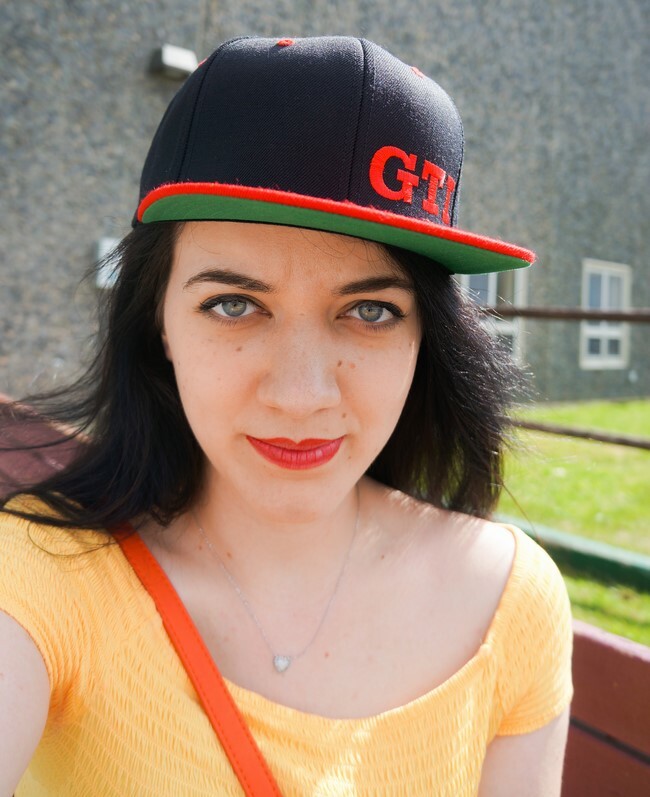 PS: Bonus Volk-swaggin shot below featuring my new GTI snapback courtesy of VW. :P I couldn’t resist! Thanks Volkswagen! it, you happen to be a great author.I will always bookmark your blog and will often come back down the road. Next Next post: Hack. Play. Create.